Juniors Noah Warren and Zach Larson finished the regular season and will open regional tourney action on Thursday, Oct. 5. 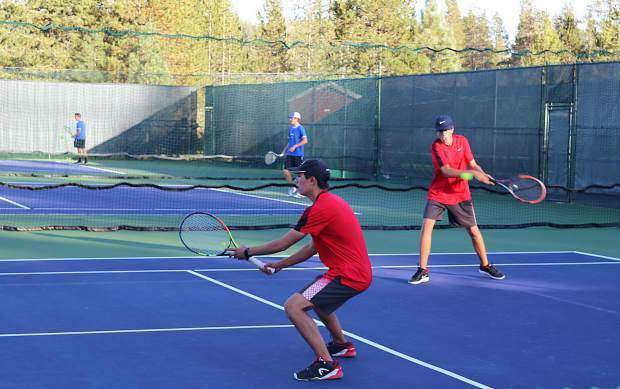 The Truckee boys’ tennis team concluded their regular season on Thursday, Sept. 28, with a 10-8 win over South Tahoe to finish the year undefeated at 10-0. The team stated early in the year that their goal was an undefeated regular season, and after topping South Tahoe in the finale, the Wolverines will now focus their attention on the Class 3A Northern Region Tennis Championships. Junior defending state champion Zach Haas capped off another impressive regular season with an 18-0 record, dropping just three games throughout the year. Haas didn’t drop a game against South Tahoe, winning 6-0 in each of his three matches. The doubles team, juniors Noah Warren and Zach Larson continued to dominate their opponents, going 3-0 against South Tahoe to improve to 19-0 on the season. The duo has been pushed at times this season with close matches against Churchill County and South Tahoe, but in each of those instances has found a way to come out on top. Truckee also got doubles wins in the regular season finale from junior Turner Drummond and sophomore Patrick Hogan. The duo went 2-1 against South Tahoe. Hogan finished his year 13-3 in doubles play, while Drummond went 12-5. Together, the duo has dropped just two sets on the year. Junior Jack Keith and sophomore Lucas Kraatz gave the Wolverines their final two wins of the regular season, going 2-1 against South Tahoe. The two dropped just four sets throughout the regular season. Truckee will open postseason play at home on Thursday, Oct. 5, with a matchup against No. 4 seed, North Tahoe. The boys have taken victories of 14-4 and 15-3 in two contests against North Tahoe this season. The matchup is scheduled for a 3 p.m. start. The Lady Wolverines stumbled in their final outing of the year, falling 11-7 to South Tahoe at home on Thursday, Sept. 28. Seniors Rebecca Ziegler and Emanuela Bosio each picked up a pair of singles wins for Truckee on the day. Ziegler closed out the regular season with a 12-2 record, while Bosio went 5-1. Sophomores Rachel Heath and Courtney Engberg led Truckee with a pair of doubles wins against South Tahoe. The duo went 6-2 on the season. Senior Sarah Jane Shaffer and freshman Lilah Abarno also picked up a doubles win. The loss is the girls’ only blemish on the season, dropping the team to 9-1. But more importantly, the defeat cost the Wolverines the No. 1 seed heading into the regional tournament. The girls will play host to Incline on Thursday, Oct. 5 at noon. Truckee owns a pair of 10-8 victories over Incline during the regular season.